This simple strategy has helped me pull off many great meals when time is short. I have no need to purchase any processed meals with this strategy. My refrigerator is always full of produce, so I always have many different options to choose from. I have tried to have a little fun with the idea along the way by including my kids in the mix. I pull out a bunch of vegetables and ask them to choose two that look like they might go together. We have had some interesting stir fries that I would not have thought of! Here is a simple stir fry that I whipped up in a pinch. Cook the chopped chicken and garlic in a large pan, wok, or stainless steel electric skillet in a small amount of oil until nicely browned and remove to a platter. 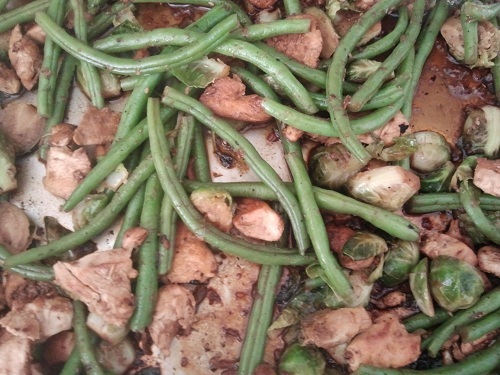 Stir fry the Brussels sprouts in a small amount of water until they are tender and remove to the platter. Add the ingredients back into the pan and add the Yoshida's sauce and heat through. I did not even bother to make a grain for this dinner meal. I simple sliced a loaf of artisan bread, and quickly made a fruit salad of chopped watermelon, strawberries and banana. 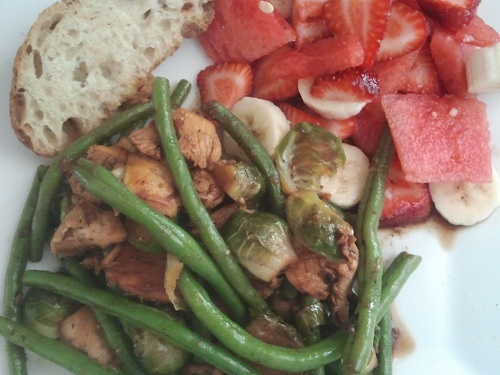 The meal was quick, delicious, and included lots of healthy produce. 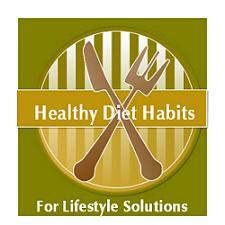 Cooking simple stir fry meals is a healthy diet habit! 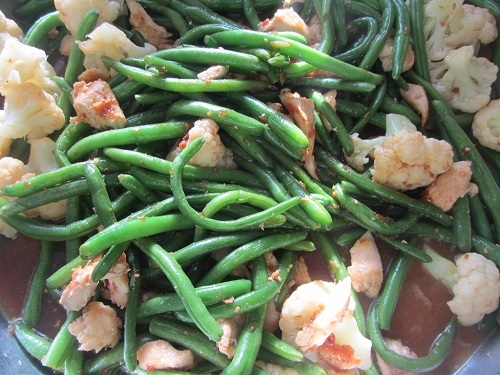 This is another variation of a green bean stir fry! If you don't like the Brussels Sprouts, substitute in the Cauliflower or another vegetable that you love!